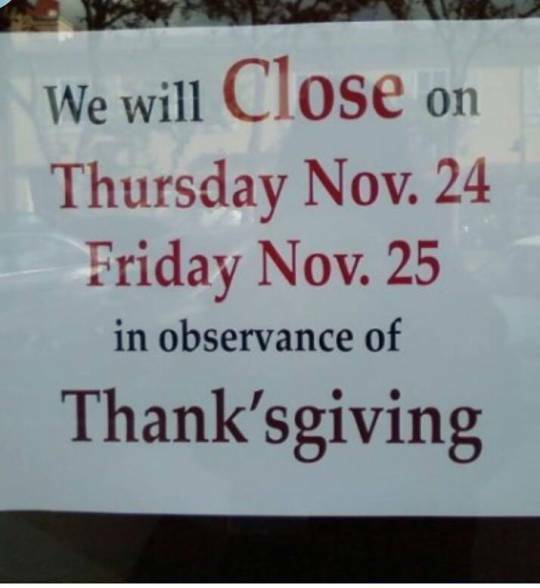 I hope you have enjoyed this week of Thanksgiving Grammar Giggles and I hope you had a great Thanksgiving. For the final post, when the schools can’t even get it right . . .
Random apostrophes–love them! 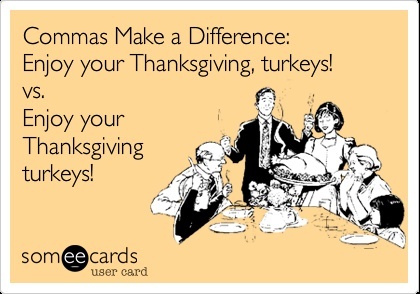 The only reason a word like this would ever have an apostrophe would be if letters were missing, as in Thank[your mama]sgiving. Otherwise, as in this example, I have no idea why there would be an apostrophe in the middle of this word. I found this one on Google. Unfortunately, I can believe that someone at the History Channel made this error because lots of people do. I even made it in a post once and even admitted it (here). But really. then and than are not that difficult. 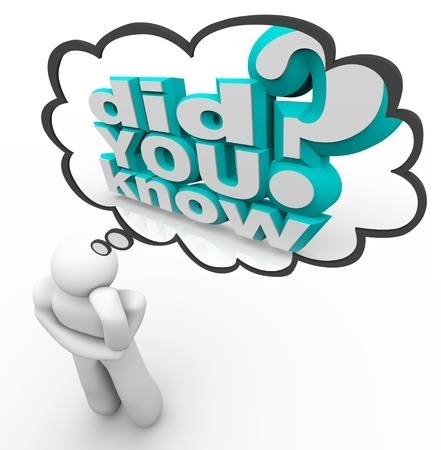 Then has an element of time (and then and time both have the letter “e”). Than refers to a comparison (and than and comparison both have the letter “a”). 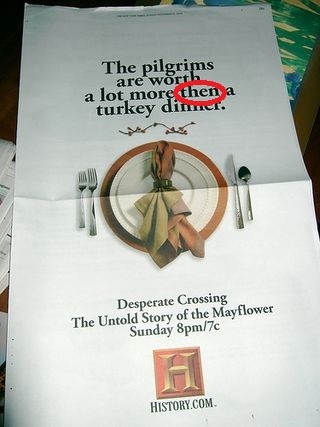 So now that you know better, here is day 2 of Thanksgiving Grammar Giggles. 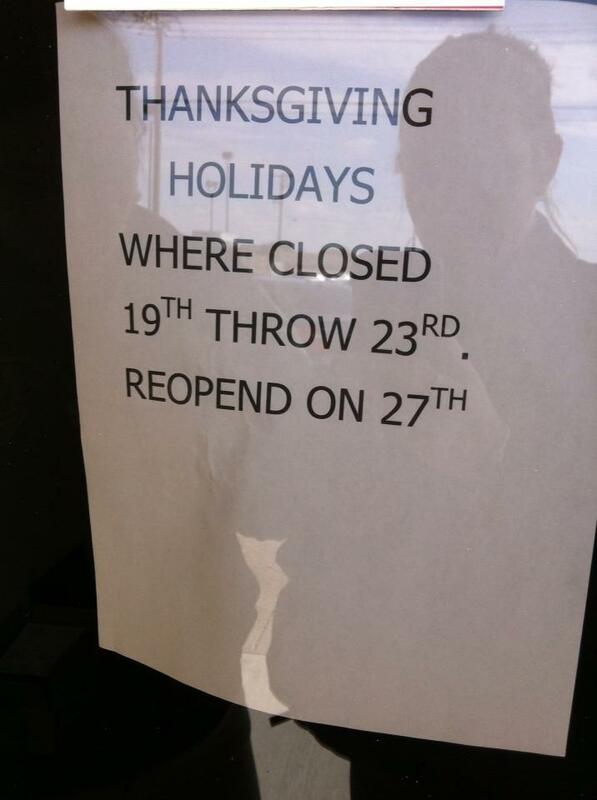 In honor of Thanksgiving this week, we will post a Grammar Giggle that is somehow related to our holiday each day. I do hope that you are thinking of all you have to be thankful for and will allow me to say “Thanks” for supporting this crazy blog by contributing and by following. I am truly thankful for you. Now on to our Monday Grammar Giggle. This sign is just a hot mess. This picture is from my last trip to one of my favorite restaurants. There IS a difference! I live in the DESERT and I love to eat DESSERT. 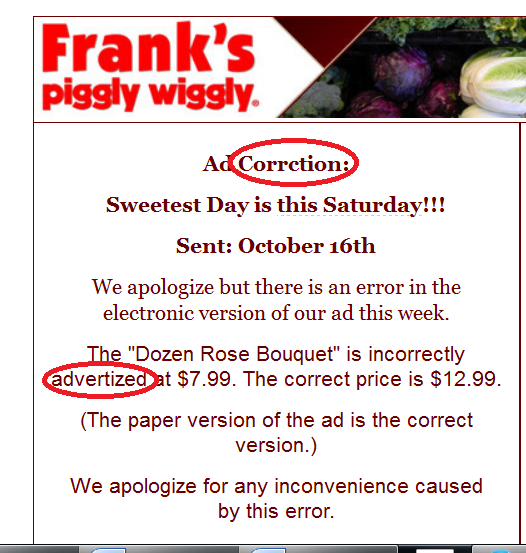 Here is an ad correction to a Piggly Wiggly electronic ad that doesn’t seem to make things any better. At least their price is now correct–hopefully! This was forwarded to me by a friend in another law firm who received it from opposing counsel in one of their cases. I understand some words are confusing, but if you struggle, take the time to learn them. Accept means to take or to receive and except means to exclude. So effectively what the attorney is saying in this letter is that his client will exclude the offer, which I would take to mean he did not want to accept it. 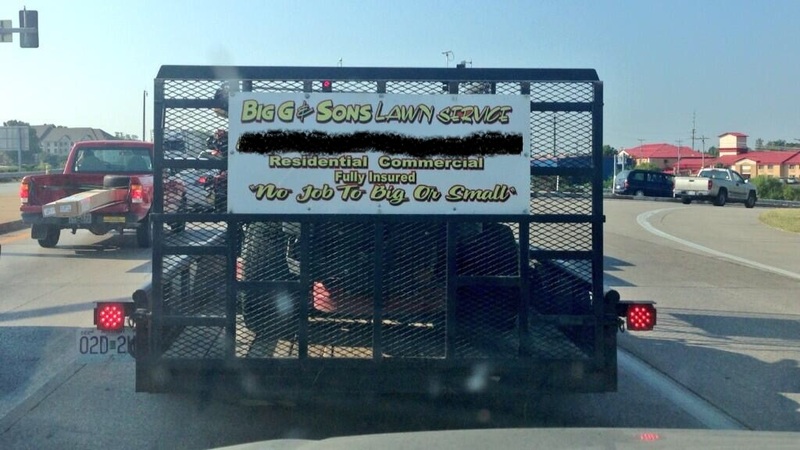 Somehow, I don’t think that is what the attorney had in mind. This one comes from Twitter. The confusion between to, too, and two is high, but signmakers need to do more than use the “that’s the way they gave it to me” excuse. Between a few people, one can hope that someone would get it right. Then again . . .